William James? Gerald G. Jampolsky? Judy J. Johnson? Apocryphal? Dear Quote Investigator: Recently, I came across a quotation attributed to the famous philosopher and psychologist William James about the difficult task of changing one’s belief system. He stated that one must let the past slip away, and one must dissolve fears. I do not recall where I read this statement, and now I am not sure it was really from James. Would you please help? 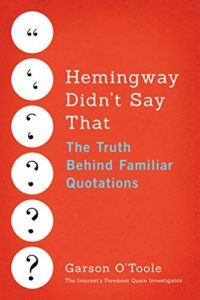 Quote Investigator: QI has found no substantive evidence that William James authored a matching quotation, and QI conjectures that the common misattribution is due to an error in a 2009 book. Details are given further below. The world we see that seems so insane is the result of a belief system that is not working. To perceive the world differently, we must be willing to change our belief system, let the past slip away, expand our sense of now, and dissolve the fear in our minds. This changed perception leads to the recognition that we are not separate, but have always been joined. Edward R. Murrow? Knute Rockne? William James? William Fitzjames Oldham? Josh Billings? George Craig Stewart? Luther Burbank? Anonymous? These words have been attributed to the prominent journalist Edward R. Murrow, the famous football coach Knute Rockne, and the influential psychologist William James. Would you please explore this topic? The name “Bishop Oldham” was ambiguous, but his first name and middle initial were given in the August 24, 1904 issue of “Zion’s Herald”. 2 William Fitzjames Oldham served in the Methodist Episcopal Church and performed missionary work around the globe. Knute Rockne used the expression in a newspaper column in 1926, but he disclaimed credit. William James received credit by 1946, and he did write a thematically similar passage in 1907 before his death in 1910. Yet, QI has found no direct evidence that James made a closely matching statement. Edward R. Murrow received credit by 1949, and he may have used it after it had been circulating for years. William James? Scott Jurek? Apocryphal? These words have appeared on many web pages and in several books. The influential American psychologist and philosopher William James has usually been credited. Yet, I have never seen a supporting citation. Is the ascription to James accurate? The existence of reservoirs of energy that habitually are not tapped is most familiar to us in the phenomenon of ‘second wind.’ Ordinarily we stop when we meet the first effective layer, so to call it, of fatigue. We have then walked, played, or worked ‘enough,’ and desist. That amount of fatigue is an efficacious obstruction, on this side of which our usual life is cast. But if an unusual necessity forces us to press onward, a surprising thing occurs. The fatigue gets worse up to a certain critical point, when gradually or suddenly it passes away, and we are fresher than before. We have evidently tapped a level of new energy, masked until then by the fatigue-obstacle usually obeyed. There may be layer after layer of this experience. A third and a fourth ‘wind’ may supervene. Mental activity shows the phenomenon as well as physical, and in exceptional cases we may find, beyond the very extremity of fatigue distress, amounts of ease and power that we never dreamed ourselves to own, sources of strength habitually not taxed at all, because habitually we never push through the obstruction, never pass those early critical points. William James? Ralph Barton Perry? Henry James? Anonymous? The best use of life is to spend it for something that will outlast it. A version of this saying was listed in the Wikipedia entry for James, but more recently it has been removed. Perhaps you can verify this quote and determine the correct version. “The great use of a life,” James said in 1900, “is to spend it for something that outlasts it.” This outlasting cause was then, as in earlier days, the happiness of mankind. QI has not yet identified a text dating to 1900 containing the quote, and does not know why the editor did not provide a footnote or annotation for the saying. Bertrand Russell? William James? Oliver Wendell Holmes, Jr.? Oliver Wendell Holmes, Sr.? What seems like sudden insight may be misleading, and must be tested soberly when the divine intoxication has passed. Can you determine who experienced this eccentric revelation? A strong smell of turpentine prevails throughout. An individual using the handle “joculum” investigated this quotation and posted a valuable analysis here on LiveJournal in 2008. The address by Oliver Wendell Holmes, Sr. was located by joculum before QI found it independently. William James? Dorothy Parker? Ogden Nash? Mrs. Amos Pinchot? Alice Duer Miller? Apocryphal? Anonymous? Could this comical tale about the famous psychologist be correct? Quote Investigator: Probably not. This poem has been attributed to Mrs. Amos Pinchot, William James, Dorothy Parker, Ogden Nash, and others. The earliest citation located by QI appeared in 1939 and credited Pinchot, but a cite in 1942 claimed that she denied the attribution. No decisive candidate for authorship has yet emerged in QI’s opinion. William James did experiment with psychoactive agents, but his name was not connected to this verse until many years after his death. The earliest attribution to James located by QI was dated 1953, yet his life ended in 1910. She dreamed one night that she had written a poem so beautiful, so wise, so close to the ultimate truth of life that she was immediately acclaimed by all the peoples on the earth as the greatest poet and philosopher of all the ages. Still half asleep as the dream ended, she stumbled out of bed and scribbled the poem down, realizing that she must take no risk of forgetting such deathless lines. She awoke in the morning with the feeling that something wonderful was about to happen—oh, yes! Her poem. The spelling and wording of this poem do differ from the most common modern versions, but QI believes that the words above likely correspond to the ancestral verse. The dream state is certainly an altered state, and it does generate insights, both genuine and spurious. But it is a relatively conventional mental excursion.